How many larvae to sample? Larval and juvenile fish from sibling cohorts often have skewed size distributions due to interindividual variation in growth rates. How many larvae should be sampled to get a repeatable average size measurement for a cohort? This information is important for studies comparing the effect of different treatments on larval or juvenile growth. After completing a trial on the size distribution characteristics of yellowtail kingfish sibling cohorts, I thought it might be a good idea to use the detailed size data set to address a question that had been nagging me for a while: how many individuals should we be sampling to obtain a good estimate of average size? A resampling analysis was used to determine how much sampling effort was required to achieve repeatable average size estimates in populations of juvenile yellowtail kingfish Seriola lalandi. One hundred juveniles (30 days post-hatch) were measured for total length and wet weight from 9 cohorts reared in captivity. From an analysis of cohort size distribution the mean was determined to be a suitable measure of the average for length, while the median was best for weight. One thousand resamples of mean length and median weight were performed for each cohort data set, with sample sizes ranging from 2 to 100 individuals. 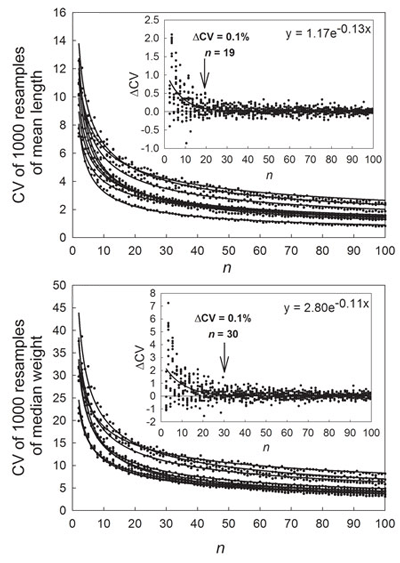 The point at which increasing sample size resulted in only a negligible increase in precision (variance between resamples <0.1%) corresponded to n = 19 for mean length and n = 30 for median weight (see figure below). Changes in the coefficient of variation (CV) of mean length and median weight between resamples of nine juvenile yellowtail kingfish populations. The amount of variance in average size between resamples decreases with increasing sample size. Since yellowtail kingfish display a magnitude of sibling size variation similar to other marine species, the sample sizes determined in this study can act as a general guideline for larval fish studies. Moran, D. (2011). 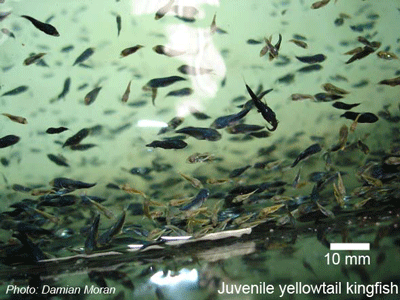 Analysis of sampling effort required to obtain repeatable average size estimates of juvenile fish. Aquatic Biology 11, 239-242. This work was made possible by a postdoc fellowship from the NZ Foundation for Research Science and Technology and a Marie Curie Intra-European Fellowship.